We make no secret of our affection for the mythical quality of Leica Camera – the Ape camera is in fact a Leica M10. And equally legendary are luggage makers, Globe-Trotter. Renowned for stylish yet hardwearing travel bags handcrafted in Hertfordshire by highly skilled artisans. It’s great news then that the two brands have collaborated to create the Leica Q ‘Globe-Trotter’ Camera. The new model is wrapped in specially selected Globe-Trotter leather in navy or light pink. As with all Leica cameras, the Leica Q ‘Globe-Trotter’ features the classic Leica ‘red dot’ logo on the front and limited edition serial number engraved on the top cover. 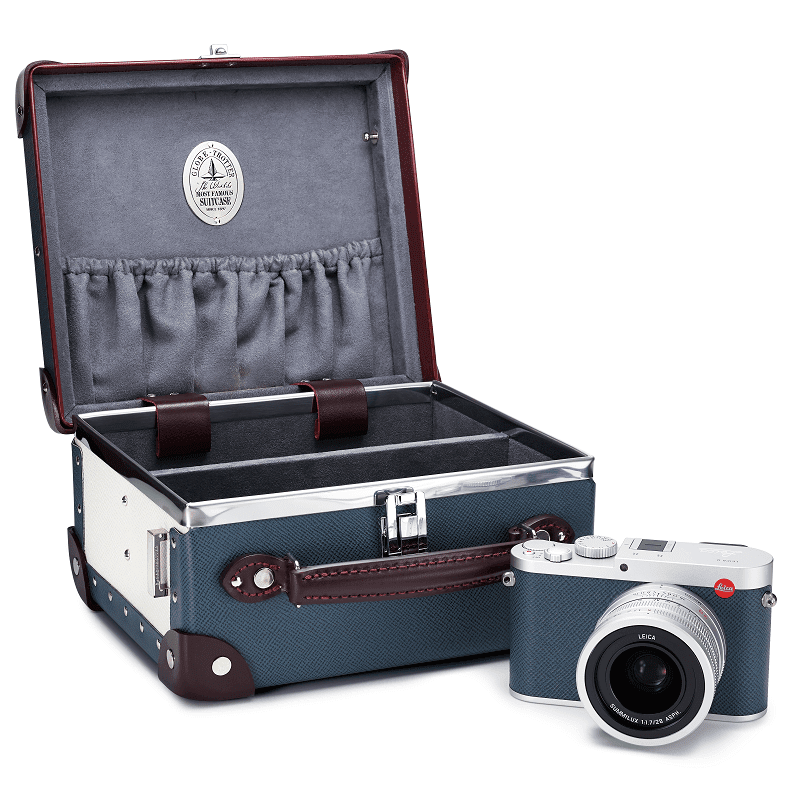 And for those of you seeking unique protection, the Leica Q ‘Globe-Trotter’ comes in a specially produced case based on the historic nine-inch Mini Trotter, encased in leather to match the camera body. The Mini Trotter inspired case is instead of the usual vulcanised fibre material used, covered in the same colour Jet leather as the Leica camera body. Within there are dividers for organising smaller items, a soft microfiber lining, and an inside pocket on the case lid for a wallet and mobile phone. 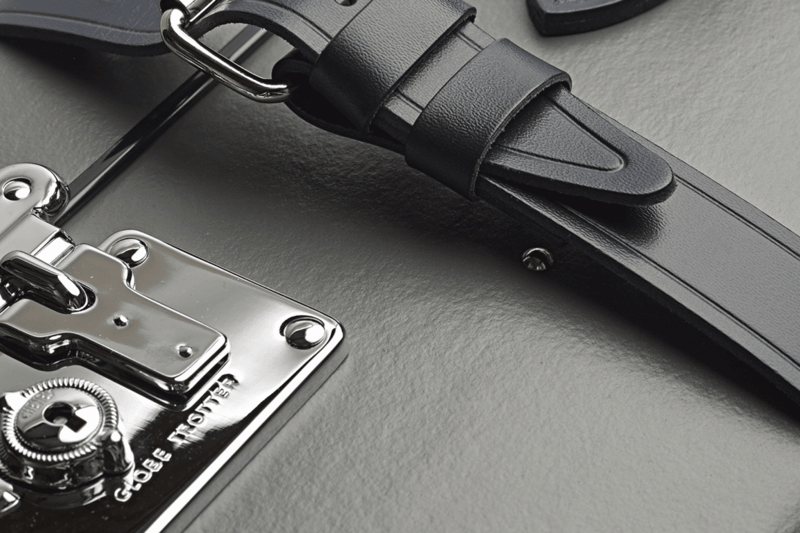 The case also features a Bordeaux-coloured adjustable shoulder strap that matches the corner leather pieces. The Leica Q lying beneath this Globe-Trotter charm features a 24 million pixel full-frame sensor and high-performance, bright lens on a silver Leica Q body. Thanks to its particularly fast Leica Summilux 28 mm f/1.7 ASPH. lens, the Leica Q is perfect for photography in low light, for street photography, architecture and landscapes. All functions of the camera are clearly laid out and logically placed to guarantee perfect ergonomics. Its clear and logical menu concept provides rapid access to all essential functions and enables users to programme personalised settings. The Leica Q Globe-Trotter is limited to 50 pieces in each colour and is available now at the Leica stores in Mayfair, City of London, Manchester and selected authorised dealers. RRP: £5,400 inc VAT.